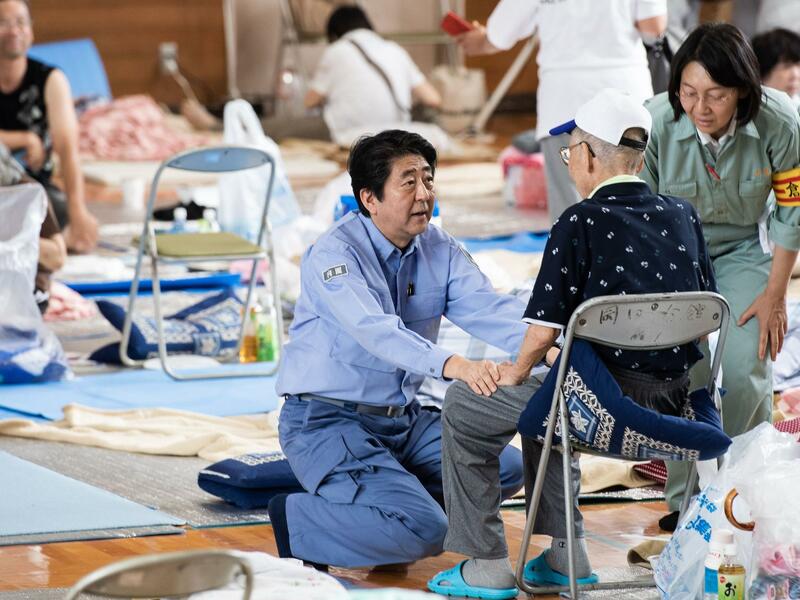 Japanese Prime Minister Shinzo Abe visits a shelter for people affected by the recent flooding in the Okayama prefecture on Wednesday. The death toll from record-breaking floods in western Japan has reached at least 176 as rescue workers searched for dozens missing in hardest-hit Hiroshima and Okayama prefectures. Chief Cabinet Secretary Yoshihide Suga announced the death toll Wednesday, The Japan Times reported. As of Tuesday afternoon, more than 50 people were still listed as unaccounted for, the newspaper said. A new evacuation was ordered Tuesday for the town of Fuchu, after the Enoki River overflowed the previous day, the newspaper said. According to the Times, "About 1,000 rescuers continued to search in flooded areas of the city of Kurashiki, Okayama Prefecture, for people trapped in their homes. More than 20 people died in the city after river dikes collapsed, inundating around 4,600 homes." Tens of thousands of rescue and recovery workers were digging through the debris as the search entered its fifth day, The Associated Press reports. Prime Minister Shinzo Abe visited the flood-ravaged region, promising that his government would do whatever it could to bring a return to normalcy. In the city of Kurashiki in Okayama Prefecture, Teruo Sasai, whose house, along with nearly a dozen others in his neighborhood, was flooded out; he described the destruction "unbelievable." "The floodwaters were up over my house, probably reaching 4 or 5 meters [13 to 16 feet], up past the roof all the way to the TV antenna. Thankfully, I was OK and nobody in this neighborhood was severely injured," he told the Kyodo news agency. "We're still cleaning up. But I'd guess that in order to recover, it's going to take at least a year, and cost hundreds of millions of yen or more," he added. "Although the government has yet to fully establish the extent of the damage, some 347 homes were totally or partially destroyed and 9,868 homes were flooded as of Tuesday morning, according to the Fire and Disaster Management Agency. "The figures are expected to rise substantially, since municipal authorities have yet to finish their own damage assessments."